I am learning Mandarin, and I am having a blast! I am not taking any classes, I am not studying per se, and I have not even met a single Chinese person. 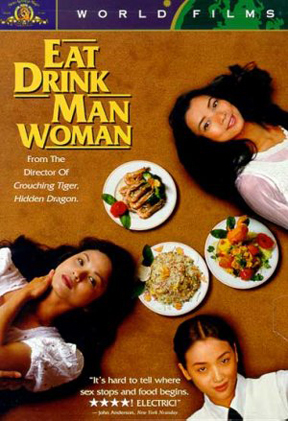 Last night, I watched Eat Drink Man Woman, and the night before, Wedding Banquet, two critically acclaimed Ang Lee comedies. (A couple of weeks ago, I enjoyed Ang Lee’s thriller Lust, Caution). On average, I spend just 30 minutes a day watching Mandarin movies or TV shows. If I can learn Mandarin this way, you can learn any language, despite your busy schedule and limited energy. All you need to do is starting downloading movies in your desired language (with English subtitles is fine to begin) and find some shows on YouTube (I recommend children’s programming). In short, this is what my experiment sets out to prove. No, this is not the fast way to learn a language. The fast and most effective way to learn a language is to completely immerse yourself in it. Go live in a country where it is spoken, make a lot of native friends, listen to countless hours of radio and video, devour the literature, speak all you can, and get a private teacher to correct your structure, pronunciation, and the pages of essays you should write each day. What? That is not an option for you? You are extremely busy and have a series of professional and personal commitments that keep you otherwise engaged from sun to sun and well into the night? Even the thought of scheduling regular class times with a teacher over Skype is daunting? Welcome to my world. I have three jobs, a family, and I study Law. Of course, like you, I do need a little time to wind down. I used to do that by playing pointless blitz chess online. But watching films in Mandarin is my new way to relax at the end of a long day. I often do that by myself at one o’clock in the morning. However, depending on the genre, my wife will sometimes enjoy Chinese movies with me (at a more civilized hour). My daughter, who does not mind subtitles, will watch movies like Finding Nemo or Mulan with me in Mandarin. I am not making fantastic progress. After eight months, I estimate that I understand about four percent of the dialogue in a brand-new Chinese soap opera episode, without subtitles. At this rate, at the end of six years, my listening comprehension will probably be at a low- to mid-intermediate level. However, I am having fun, so I am very likely to stick with it. Beyond my experiment, my guess is that within a decade I will understand Mandarin quite well, and within two decades, I will speak and read Mandarin fluently. I will have surmounted the ultimate language acquisition challenge without giving up anything except pointless online blitz chess. I will reap a series of benefits, such as improved brain power, deep insight into a culture that is incredibly rich and highly relevant to contemporary society, and renewed professional horizons. So what are you waiting for? Start your own language acquisition adventure today and learn Mandarin, Arabic, Japanese, German, or might I recommend Brazilian Portuguese? (Please note I have updated my Chinese films table and my graphs). In addition, at some point you will need to add other elements to learn to speak, read, and write. However, listening comprehension is an excellent first skill to develop, and mastering it will make acquiring the other skills comparatively easy down the line. I’m a full-time civil servant with managerial responsibilities and an intense travel schedule, in the evenings I provide support to my small business with its dozens of employees, and on the weekends I manage my tree farm. I’m my daughter’s driver to gym and school in the morning, spend time with my family in the evening, practice meditation daily, and stay in pretty good shape. Next semester I’ll be starting up my Law program at the University of Brasilia again. Which was likely downgrading rather than improving my game, since I didn’t take the time to play longer matches or to study at all. I was playing 5-minute time controls and even starting to play lightning chess (1-minute per side), which is especially inane. I do love and miss chess, but learning Mandarin is more rewarding for me. In my Week 14 post, I tackled the question Why study Mandarin? and explained the motivation behind my unusual methodology. I also asked my readers to indicate which language they would fancy learning without any effort. Of course, there is no magic pill nor even anabolic steroids for acquiring languages. Even if there were, I would prefer not taking them, assuming there would be harmful side effects. Just like in natural bodybuilding, half the enjoyment and value is in the process. The satisfaction that the results bring is enhanced by the memory of the struggle and the associated health benefits. Thus, it doesn’t daunt me that learning Mandarin might take a decade or more. That knowledge does not keep me from wanting to improve my mastery of other languages and even dreaming of learning new ones. I spent this past week in Paraguay, and while I enjoyed practicing my Spanish, I was captivated by sueños guaraníes. How cool would it be to learn an Amerindian language—one that, with its variants, was once the lingua franca in a large swath of South America; gave name to countless cities, natural landmarks, and wildlife in Brazil and neighboring countries; and is still spoken by millions of Paraguayans and thousands in Brazil, Bolivia, and Argentina? Like Mandarin, the challenge would be enormous, given its complete lack of organic proximity to the Western languages I already speak. While I’m dreaming, another fascinating challenge would be learning Sanskrit. Like Latin, this ancient Indo-European language evolved into or influenced several contemporary vernaculars. It is the language of millennial Vedic philosophy and by some considered unusually flawless and rich. Unlike Latin, there is controversy as to whether it is a dead language: a few thousand people currently consider it their native language, literature is still published in Sanskrit, and there is a strong revival movement in India. A more modest and short-term goal would be to bring my French back to par, and I am just waiting for a good opportunity to do so, though to begin I should start listening to Radio France Internationale again. In the meantime, I’d better get back to Qiao Hu and my Mandarin films. I’ve fallen behind recently on my viewing time. See Autobiography of a Yogi by Paramahansa Yogananda, end of Chapter 2. Learning a new language is fun and rewarding on many levels, yet relatively few people do so unless circumstances require it. The main reason is that language acquisition is hard and demands time—a lot of time. It is psychologically difficult not only because it requires perseverance, but because progress is incremental. You can go days at a time without noticing much progress, making it hard to stay motivated. Tackling Mandarin is particularly challenging. According to the State Department, it is a Category 4 language and thus takes nearly four times longer to learn than a Western European language. Obviously, Mandarin acquisition is no walk in the park; it’s more like a cross-country hike. I love hiking, and the longer, the better. However, on long nature hikes it is reassuring to have a guide or GPS and a good map—or at least a well beaten trail. On my Mandarin-acquisition trek, by contrast, I’m trailblazing. There are no signposts, and some sober people tell me that I cannot even get to my destination the way that I’m going. I’m walking all alone (though I was bringing my daughter along for a while). What makes it most difficult, however, is that I’m walking so little each day—just 35 minutes on average. Thus, not only is my destination very far off, across an uncharted wilderness, but I realize I will take many years to get there, if ever. It’s reminiscent of the title of one of the first movies I watched in Mandarin, Riding Alone for Thousands of Miles. If I didn’t have extensive experience with foreign languages, and a strong belief in my language acquisition theories, I would likely have given up already. Like many things in life—the really good things that take a great deal of time and effort to attain—you just need to have a little faith. Faith isn’t blind pursuit; it is confidence in things unseen. When pursuing a long-term goal, day-to-day circumstances—especially the lack of apparent progress—can be discouraging. Thus, once you’ve charted a course, as wisely as you can, you need to have faith and just keep walking. Even then, many people, such as expatriates or immigrants, manage to avoid learning more than the basics, year after year. Some argue that Mandarin is significantly more difficult than other Category 4 languages and should be a in a separate category.